A member of the nobility and younger sister of the captain of Silver Eagle. Noelle Silva is a member of the Black Bull squad. She was inducted to the squad around the same time as Asta. 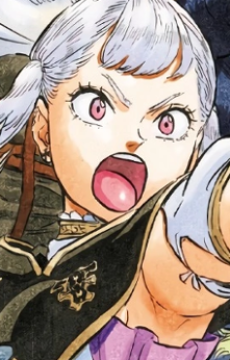 Noelle is the second daughter of the Clover Kingdom's family, House Silva, which is affiliated with royalty and the younger sister of the captain of Silver Eagle Squad. Her family disowned her due to her lack of control on her magic and possibly due to blaming her of the death of her mother, the Steel Princess, after delivering Noelle.